The withered, aching heart of “Mother!” pulsates with the awe of an entrenched complexity. What seems to function as a mild excursion into the lives of isolated personalities becomes an endurance test for their sanity, disturbed by details that seem inconsistent, twists that are abstruse and an overreaching awareness that taunts, baffles, intrigues and ensnares the audience in the thick of great moral doubt. To gaze at any minute of Darren Aronofsky’s challenging opus is to sense its very nature to polarize all within its grasp; no two sets of eyes will find the same solution, and many will stagger away from the experience without a concise verdict. But no other film in the recent snapshot of time comes close to sharing its austerity – not even his own “The Fountain,” widely recognized (until now, at least) as his most mystifying. One’s understanding comes down to recognizing the effort as a concentrated descent into the membrane of narrative and artistic metaphors. While most are eager to exploit the suffering of the flesh and the cynicism of their sources for a shallow measure, here is a man who plunges right into the nervous system and encounters the very meaning of the living cinema. Nearly every conversation about his movie begins with the division of the audience. When it opened in wide release at the beginning of the autumn, momentum was propelled by a misleading promotional engine; trailers implied moviegoers would be flocking to a horror film with some level of frenetic psychological tension. What they found, instead, was an intrusive drama that lacked definitive cues, in a plot that didn’t so much have conclusive ideas as it suggested the absence of a logical reality. In the more low-key arthouse division “Mother!” would have endured as a fascinating conversation piece; in the mainstream, out in the wide open, calling to the same audiences that flock to blockbusters and the latest entries in the Marvel extended universe, it was dismantled in a series of abrupt walkouts and spiteful vitriol (the movie earned the dreaded “F” CinemaScore rating). Several critics, however, sung its praises – or if not, at least valued its stimulating edge. And now Aronofsky’s daring exercise will forever be cast in the shadow of its box office failure, a result earned from studio heads who were hoping to replicate the success of “Noah” without considering the fragility of public acceptance. Those who stayed, embraced and ultimately contemplated the ulterior motives of the images found something profound. 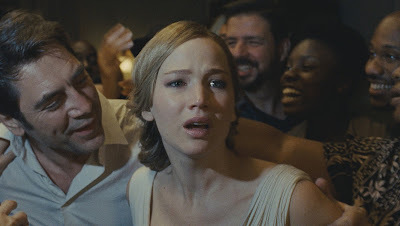 The movie tells of the strange experience of two isolated characters at a house in the forest – one a poet with paralyzing writer’s block (Javier Bardem), and the other his wife (Jennifer Lawrence), who is rebuilding their home after an apparent fire (the opening shot briefly implicates this setup). Both are kind, calm, devoted personalities who say more with their eyes than words, and a great pain may be fueling their bond from the mental periphery. On one night, however, the silence is interrupted by an ominous knock at the door, and a man (Ed Harris) arrives with wrongful assumptions that he has been directed to a bed-and-breakfast. Sensing a kindness that has a warm allure (at least compared to his monotonous grind), the husband invites him to stay. They have lightweight and enthusiastic conversations. She is apprehensive, but supportive of his impulsive suggestion – until later that night when she spies a private exchange in the bathroom that suggests a looming danger. The following morning, the man’s wife (Michelle Pfeiffer) arrives to join the stay, leading to a discomfort between others in the house that evolves, unfolds and leads to a chaos that slowly creeps into their static lives. The figures move not with singular intentions. Every move seems quietly choreographed to undermine the security of the Lawrence character, who is usually seen in private contemplation of the events that swirl around her (one of the movie’s most suggestive tricks is an ongoing routine where she senses a heart beating within the walls of the house, gradually turning black as the corridors are infested with uninvited guests). Pfeiffer’s character becomes intrusive and belligerent, leading to a curious scene where she wanders upstairs into the poet’s study and spies his prized possession: a crystal on the mantle that apparently functions as his creative anchor. But all inquisitive natures are destined to inspire accidents, and the woman shatters the artifact in what turns out to be the first in a chain reaction of events – the husband boarding up the study to prevent reentry, the wife insisting they leave despite their ambivalence to do so, an exchange of sexual passion, and then the arrival of their two feuding sons, one of whom is destined to murder the other in cold blood. Perceptive theological eyes will easily sense Aronofsky’s agenda: he is telling an allegorical story using the legend of Adam and Eve as his framing essence. Nearly every detail that precedes and follows mirrors a biblical fundamental, down to the injured rib on the Ed Harris character (Adam) leading to the arrival of his wife (Eve). The sons are stand-ins for the Cain and Abel personas, while the elusive study upstairs is meant to symbolize the garden of Eden (from which both are cast out after the apple – or in this case, the crystal on the mantle – is touched). But if we apply that logic, who are the Barden and Lawrence characters meant to represent? What point does Aronofsky insist on them and us, especially given his track record as a facilitator of obsessive pathological states? I believe they both represent God and Nature, perhaps to study the hypocrisy of those who are quick to admire the man as the supreme creator when the female identity does all the work and takes none of the credit (notice how all the characters at a wake following the son’s murder all flock devotedly around the poet while only sneering sarcastically at his wife, even though their house would not be without her impeccable craftsmanship). Why must it be there at all, then? The movie might not have been as pointed (or as mind-wrenching) without taking the most savage risks; they play as pieces of a visual symphony that ebbs and throbs with all the dynamic movement of a Stravinsky composition, and each frame functions as a conduit in holding the human condition accountable for its abuse of the divine (is this house a house at all, or symbolic of the Earth being destroyed by careless dwellers?). And yet given its nature to provoke, must we stifle the conversation at mere allegorical ideas? The biblical implication is obvious, but are there added meanings when we see the material from differing angles? Could these scenes not also fit an argument on being pro-environment, or even be about the urgency of climate change? Could Bardem and Lawrence’s volatile existence be eluding to the cult of celebrity? Or be a parable about agoraphobia? Or, if you want to take a far more radical approach, a figurative protest against socialism? The open-ended mystique of “Mother!” allows us to sense these ideas in just about any philosophy we apply to its frames. Aronofsky didn’t just orchestrate a skillful allegory, but made a universal parable at which the frenetic dissolves into a lengthy beat of emotional meditation, where each of us attempts to reason with the specifics in a way that match our own conflicted value systems. If some remain at fundamental odds with the material – one colleague referred to the film “misogynist and ugly” – then it fits the trajectory of the director’s ongoing obsession with existential asceticism. Like “Black Swan,” “The Fountain” and even “Requiem for a Dream,” the meaning of this movie comes less from a narrative action and more from ostentatious visuals exploiting the behavior patterns of the insecure and the short-sighted. Now is the time to think beyond the associations of a mere story, however, and contemplate the context at which people have been roused to seek shallow pleasure. In a climate where we are quick to diminish and disown artists for forcing their brutal honesty on audiences, “Mother!” is a challenge worth facing.